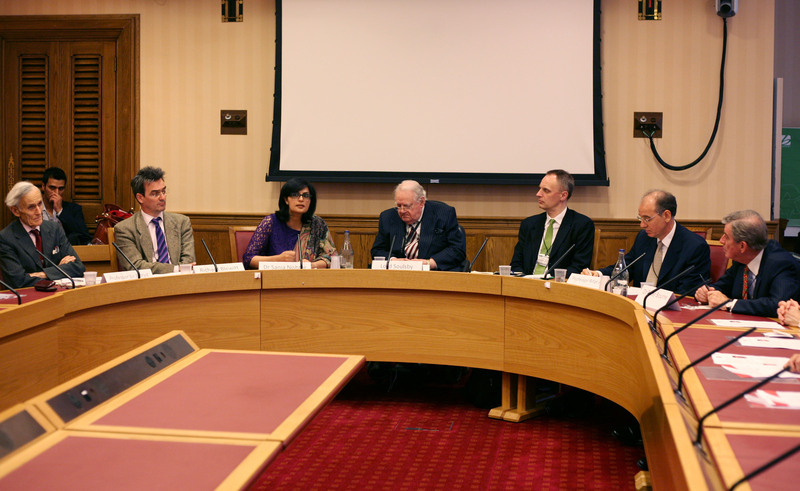 July 27, 2012: After a successful June 11 launch in Washington the Heartfile Leaders’ Network has also been launched in London at a reception at the House of Lords on July 11. Dr. Peter Bourne, Former Assistant Secretary-General at the United Nations and former special assistant to Jimmy Carter, spoke at the reception to mark the London launch; Prof. Sir Eldryd Parry, Prof. Rifat Atun, Richard Blewitt and many prominent members of the Pakistani diaspora joined the reception and pledged their support for Heartfile. Dr. Sania’s Interview in Health Check program – BBC World Service by Claudia Hammond on July 25, 2012. July 26, 2012: Pakistan was in the spotlight at the House of Lords in London on July 11. The seminar, “Innovative Financing for the Poor: Pakistan at the Cutting Edge” featured a discussion on the Heartfile Health Financing program. The event was hosted by Lord Soulsby of Swaffham Prior, and was moderated by Dr. Richard Horton, Editor of the Lancet. Dr. Sania Nishtar was the keynote speaker, alongside panelists Prof. Sir Eldryd Parry, Prof. Rifat Atun and Richard Blewitt of HelpAge International. The event was succeeded by a reception in the Attlee Room at the Lords where the London Launch of the Heartfile Leaders’ Network took place. July 23, 2012: Jennifer Brookland profusley quoted Dr. Sania Nishtar’s insights in her article “Polio in Pakistan: Who’s to blame?”, published on a popular International Development web-portal, DEVEX. Pakistan along with Afghanistan and Nigeria, remains one of the three countries world-wide where Polio is still an endemic. Read here. 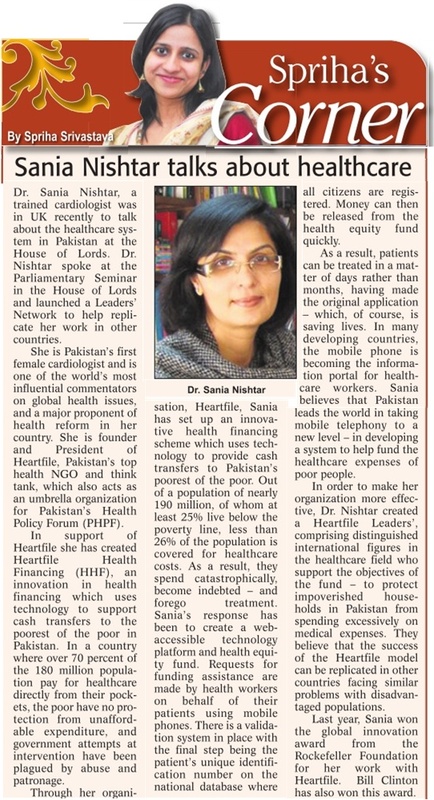 The article entitled Sania Nishtar talks about healthcare by Spriha Srivastava published in Spriha’s Corner in Voice Asian on Saturday 21 July, 2012. Polio in Pakistan: Who’s to blame? by Jennifer Brookland, Devex – International development business . careers . news. 17 July 2012.